(Nanowerk Spotlight) The application of nanotechnology to biosensor design and fabrication promises to revolutionize diagnostics and therapy at the molecular and cellular level. The convergence of nanotechnology, biology, and photonics opens the possibility of entirely new classes of biosensing and imaging nanodevices. These nanoprobes and nanosensors have the potential for a wide variety of medical uses at the cellular level. As a prime example of how the integration of multiple disparate nanotechnology fields allows the realization of novel or expanded functionalities, researchers at the University of Pennsylvania have demonstrated a multimodal sensing device which integrates the functionalities of three traditional single mode sensors. Specifically, the team, led by Ertugrul Cubukcu, an Assistant Professor in the Department of Materials Science and Engineering, fabricated a graphene-based multimodal biosensing device, capable of transducing protein binding events into optical, electrical, and mechanical signals. So rather than focusing on improving the performance of single-mode devices by developing ever more sophisticated designs and better binding-receptor molecules, the researchers' tool is a lateral approach that combines several modes of operation on a single device platform. This means that instead of detecting or analyzing biological samples via either optical, electrical or mechanical means, as most sensors do, it is possible to obtain information regarding all three properties from just a single sample. 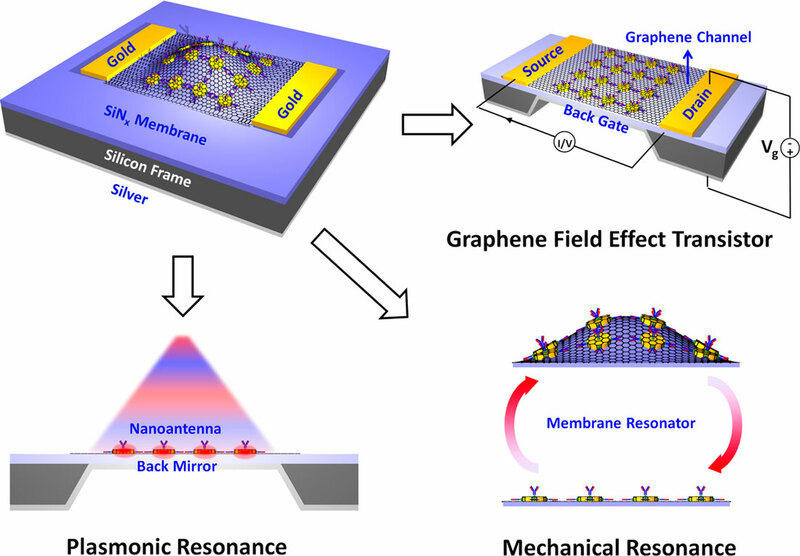 The team published their findings in the September 3, 2014 online edition of Nano Letters ("Optoelectromechanical Multimodal Biosensor with Graphene Active Region"). This work uniquely integrates a nanoelectronic graphene field effect transistor (FET) based sensor and a nanoantenna based optical sensor on a nanomechanical resonator based sensor. As the team points out, this multimodal biosensor combines all the advantages of the respective single-mode sensors and achieves a 100 times improvement in the sensing dynamic range. "Our device consists of a freestanding low stress silicon nitride membrane clamped on all sides to a silicon frame, a configuration capable of supporting high quality (Q) factor mechanical resonance modes which are highly sensitive to adsorbed mass" Fei Yi, a postdoctoral researcher in Cubukcu's group, describes the device structure to Nanowerk. "It also serves as a structural support for the subsequent introduction of plasmonically active gold nanodisk antennae and graphene monolayer transferred onto the top surface. The nanoantennae enable surface refractive index sensing via their spectrally resonant electromagnetic nearfields, while the graphene acts as a traditional field effect transistor (FET) sensing channel and bioactive interface for protein adsorption. A 100 nm thin metal coating on the underside of the membrane serves as the gate electrode – with the membrane itself as the gate dielectric." Yi points out that, to do this without perturbing the individual performances of each component, is not as straightforward as it seems, particularly in the realm of nanoscale devices. "When you are talking about co-locating active components that are individually highly sensitive to perturbations, it is very likely that performance degrades as a result," says Yutong Zhu, the paper's other co-first author. "However, with the proper choice of materials and design architecture, this can be overcome, and overall performance can be even enhanced by establishing synergies between the different sensing modes." This is the reason graphene is a key material critical to this device design: not only does it act as a functional element – graphene field-effect transistor sensor for electrochemical detection of analytes – but its atomic thickness does not significantly perturb the optical near-fields and mass response of the plasmonic and mechanical counterparts. Furthermore, graphene's affinity to biological molecules compared to inorganic surfaces like gold or silicon more than compensates for the perturbations associated with integrating these components. This integrated sensor approach has two distinct benefits: It expands upon current sensor capabilities because for the same amount of analyte three (or potentially even more) pieces of information can be obtained. It is also very straightforward to have each mode of sensing targeting a different concentration regime, thereby effectively extending the linear dynamic range of the device by orders of magnitude. Multimodal biosensors promise to create entirely new functionalities. For instance, it now becomes feasible to differentiate and, ideally, identify multiple distinct biomolecules from a mixture containing numerous unknowns, as opposed to only trying to detect for the presence of a few types of known molecules. "The only way to do this is to have real time, simultaneous measurements of a single analyte sample across several parameters – which hopefully are sufficient to uniquely establish the identity of the molecule," says Yi. "In this work we have shown that the latter is possible, while the former – simultaneity and in real time – presents unique technical challenges of its own, and is something we are working towards."